Christmas Shows in Branson offer the best Christmas productions in America. Nearly all of the shows in Branson will have some tie-in to the Christmas season. Here, we list those that have advertised a separate Christmas Show. We have provided minor detail where we felt an explanation was warranted. These are listed by Theater. 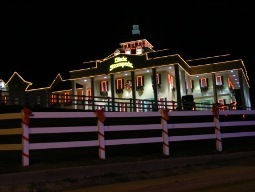 Celebrate Christmas in Branson in 2012. Liberace, Whitney Houston, George Strait , Blues Brothers, and Elvis portrayed by Dean Z. The Andy Williams’ Christmas Show in Branson this year will be even bigger and more spectacular and include a tribute to “Mr. Christmas” himself, Andy Williams, plus an hour of his best TV clips prior to the start of the show. Andy Williams was involved in all phases of his 21st Christmas show in Branson, including production, its music and the selection of the acts that will be in the show, prior to his passing in September. The full production show has spectacular sets, dancers, a full orchestra, lots of variety acts and the beautiful music and sounds of Christmas all presented in the spectacularly decorated Andy Williams Moon River Theatre. It includes dancers, singers, a huge choir and the Andy Williams Orchestra, plus feature new performers, such as; American Idol Finalist Katie Stevens; Allen Asbury, formerly with the Bill Gaither Family Singers; 12 year old Nadia Cole and the Voices of Glory from “America’s Got Talent”; and the a cappella group, The Cat’s Pajamas who have appeared on NBC’s “The Sing Off” as well as “America’s Got Talent”. This year’s production will also return popular acts from last year’s show, including; Adagio dance team and quick change artists, Pasha & Aliona who will include a brand new act never before seen on any stage; The Lennon Brothers with Gail Lennon, Mike Cathcart, The World’s Fastest Fiddler - Dean Church; and singer-impressionist Bob Anderson. “America’s Sweethearts of Song” grew up in front of the camera, performing for 13 years on LIVE television as part of the Lawrence Welk Show and sang for seven presidents. The sisters even have a star on the Hollywood Walk of Fame and are inductees to the Vocal Group Hall of Fame! Voted “Best Group in Branson 2011” and, as seen on NBC’s the Sing-Off, this a capella group will deliver a performance that will have you dancing in your seats! These vocalists will wow you with their skills, woo you with their charm, and win you over with their showmanship. No instruments necessary—they only use their voices! The spirit of the season comes alive in a holiday fantasy of twinkling lights, old fashioned holiday costumes and holiday music. Fun festivities abound with a friendly rivalry between the elves of the north pole and the elves of the south pole, ostrich races and much more. It all happens as you feast on a four course meal. For more than twenty years The King's Brass have performed over one hundred concerts each season with three trumpets, three trombones, a tuba, keyboards, and percussion. Playing a wide variety of music from Gabrieli to hymn classics, from Handel to jazz spirituals, from Christmas carols to patriotic marches, The King's Brass uses all corners of the concert hall to lift hearts and spirits in praise. Tim Zimmerman and the King's Brass Christmas Concerts present the "best in sacred brass music" during Branson's Ozark Mountain Christmas celebration. Six brothers in one of the most popular shows in Branson. 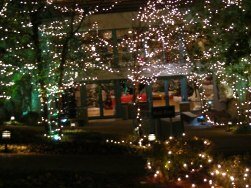 Enjoy Christmas songs with Six in November and December at Mickey Gilley's Theater. For about 2 hours, Mollie B and her friends will perform a variety of music, including a few Christmas polkas. You will get to enjoy Mollie B sing her beautiful rendition of "Ave Maria" and "My Favorite Things," as well as the "Merry Christmas Polka." This show will feature one half of Christmas theme/songs and one half of their regular season show. An original musical adaptation of the classic by Charles Dickens. An inspiring story of redemption, it features a live band, a talented cast, astounding special effects, stunning Victorian scenery and period costuming.